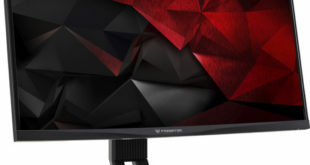 Philips launches 32:9 SuperWide curved LCD display called 499P9H is an ultra-wide 49-inch monitor. It uses VA type 8-bit LCD panel with backlighting W-LED. The screen is curved with 1.800R radius and uses the 32:9 aspect ratio. 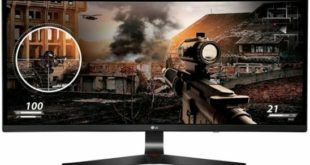 The resolution is defined Dual Quad HD, equal to 5120 x 1440 pixels, the surface is essentially identical to that obtained by adding two 27-inch Quad HD (2560 x 1440 pixels) monitors. The data sheet shows a 450 cd/m², 178º (H)/178º (V) viewing angle and a response time of 5 ms (from gray to gray). 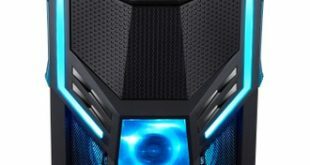 Philips 499P9H has a NTSC 103% color gamut, 121% sRGB and 91% Adobe RGB. The monitor includes a MultiClient Integrated KVM switch, you can control two separate PCs with one monitor-keyboard-mouse setup. A convenient button allows you to quickly switch between sources. The Philips 499P9H is compatible with HDR10 and features Vesa’s DisplayHDR 400 certification. The equipment also includes the Fricker-Free and LowBlue modes. Available connections include a DisplayPort 1.4, two HDMI 2.0 b, USB-C 3.1 Gen 2, three USB Type-A ports (one supports fast charging), an upstream USB 3.1 port, a Gigabit Ethernet port and a headphone output. The audio is managed by two 5W speakers each, On the upper side is finally a hidden webcam with a 2-megapixel resolution and face recognition for Windows Hello. 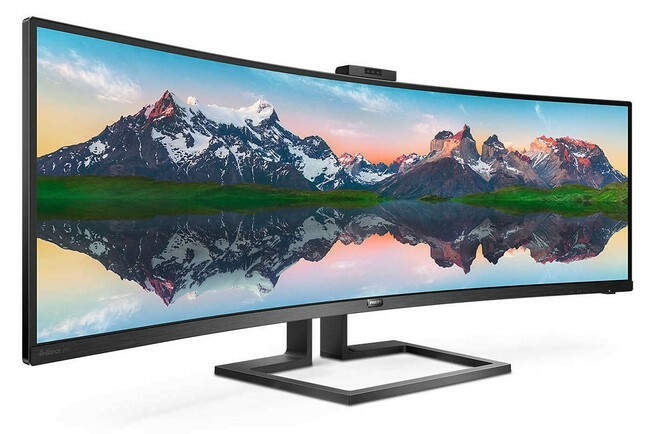 Philips 499P9H 32:9 SuperWide curved LCD display has been priced at €1,099.